The objectives of the volume are to direct the field’s attention to the unique value of studying interactions between members of different groups and to offer the most up-to-date summaries of prominent and cutting-edge scholarship on this topic written by leading scholars in the field. 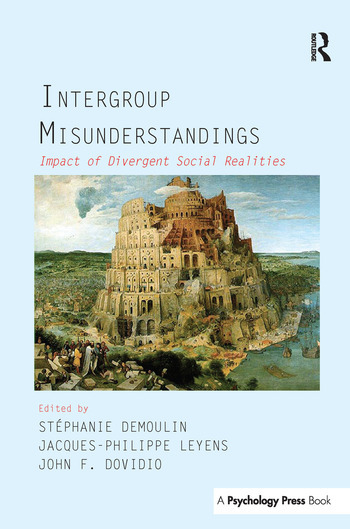 A central theme of the volume is that improvement in intergroup relationships will only be possible if social scientists simultaneously take into account both the attitudes, beliefs, emotions, and actions of the different groups that shape the nature of intergroup relations. Understanding how members of different groups interact is critical beyond the value of understanding how majority groups behave and how minority groups respond in isolation. Indeed, as the book exemplifies, groups interpret their interaction differently, experiencing different social realities; approach interactions with different goals; and engage each other with different, and often non-compatible, means or strategies. These different realities, goals, and strategies can produce misunderstanding, suspicion, and conflict even when initial intentions are positive and cooperative. The book will be of interest to professionals and students in social psychology, sociology, social work, education, political science, and conflict management, as well as scholars, students, and practitioners interested in anti-bias education and prejudice reduction techniques and strategies. S. Demoulin, J.P. Leyens, J.F. Dovidio, Intergroup Misunderstandings: Interactions and Divergences in Realities, Goals, and Strategies. J.N. Shelton, J.F. Dovidio, M. Hebl, J.A. Richeson, Prejudice and Intergroup Interaction. R.Y. Bourhis, A. Montreuil, G. Barrette, E. Montaruli, Acculturation and Immigrant/Host Community Relations in Multicultural Settings. V. Yzerbyt, C. Judd, D. Muller, How Do They See Us? The Vicissitudes of Meta-Perception. U. Hess, R.B. Adams Jr., R.E. Kleck, Intergroup Misunderstandings in Emotion Communication. M. Hebl, J.F. Dovidio, J.A. Richeson, J.N. Shelton, S.L. Gaertner, K. Kawakami, Interpretation of Interaction: Responsiveness to Verbal and Nonverbal Cues. J.M. Jones, S. Engelman, C. Turner, S. Campbell, The Universality of Racism Leads to Divergent Social Realities. T. Kessler, A. Mummendey, Why Do They Not Perceive Us as We Are? Ingroup Projection as a Source of Intergroup Misunderstanding. S. Demoulin, B.C. Pozo, J.P. Leyens, Infra-Humanization: The Differential Interpretation of Primary and Secondary Emotions. S.T. Fiske, L.T. Harris, A.M. Russell, J.N. Shelton, Divergent Social Realties, Depending on Where You Sit: Applications of the Stereotype Content Model. N. Ellemers, M. Barreto, Maintaining the Illusion of Meritocracy: How Men and Women Interactively Sustain Gender Inequality at Work. T. Saguy, F. Pratto, J.F. Dovidio, A. Nadler, Talking about Power: Group Power and the Desired Content of Intergroup Interactions. T.R. Tyler, Majority and Minority Perspectives on Justice and Trust: Is There a Consensus? A. Maquil, S. Demoulin, J.P. Leyens, Strategies for Prejudice Reduction: The Norms of Non-Discrimination. M.B. Monteiro, R. Guerra, M. Rebelo, Reducing Prejudice: Common Ingroup and Dual Identity in Unequal Status Intergroup Encounters. S.C. Wright, M.E. Lubensky, The Struggle for Social Equality: Collective Action versus Prejudice Reduction. A. Nadler, S. Halabi, G. Harpaz-Gorodeisky, Intergroup Helping as Status Organizing Processes: Implications for Intergroup Misunderstandings. S. Demoulin, Emotional Misunderstandings in Intergroup Negotiations.